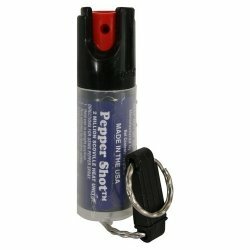 Security guard pepper spray is for some security guards, the only immediate self defense weapon that they have at there disposal. Unless a security guard is licensed to carry a firearm or has the benefit of using a more expensive non-lethal takedown weapon such as a tazer, there really isn't anything else available besides pepper spray. Security guard pepper spray is for some security guards, the only immediate self defense weapon that they have at there disposal. Unless a security guard is licensed to carry a firearm or has the benefit of using a more expensive non-lethal takedown weapon such as a tazer, there really isn’t anything else available besides pepper spray. Even if the user is licensed to carry and use a firearm, many agencies still opt for equipping their personnel with security guard pepper spray. Many local, state and federal law enforcement agencies employ the use of security guard pepper spray. This wide spread use is a testimony to the effectiveness of the agent. OC is created by extracting capsicum, normally in a power like or fine ground form, from the pepper. The capsicum is mixed thoroughly with ethanol which extracts capsaicin. Ethanol is a highly volatile liquid and after it evaporates a waxy residue is left behind. This waxy residue is OC. OC is mixed with emulsifiers so that it can be mixed with and distributed in water. This water can be used as a stream or aerosol type security guard pepper spray which is directed at the face of a potential assailant. Security guard pepper spray is called a lachrymatory chemical. A lachrymatory chemical causes pain and tearing of the eyes, general irritation, and even temporary blindness. Furthermore, with some individuals that may be sensitive to OC, the spray can even act as a skin irritant providing the subject with a burning sensation of the skin. Although pepper spray is considered as a non-lethal form of a control agent (also called a “riot control agent”) there have been a few possible linkages to OC pepper spray and death, but these are very limited and are subject to closer investigation. Conversely, there are also a very limited number of people that seem to be unaffected by pepper spray or the effects are at least minimized. However, these instances are extremely limited as well. OC pepper spray by itself is not considered as a tear gas. Two commonly used tear gas agents are phenacyl chloride or CN and 2-chlorobenzalmalononitrile or CS. Both of these chemicals are lachrymatory compounds as well. Security guard pepper spray may be purchased as a triple-action spray, which usually means it contains OC, one of the two tear gases CN or CS, and an ultraviolet dye. The OC and tear gas provide the stopping power while the ultraviolet dye aids in identification. The dye is invisible under normal lighting conditions, but when exposed to an ultraviolet (black) light, it becomes visible. This can be most useful in identifying a suspect that may get away even in the event of security guard pepper spray use. 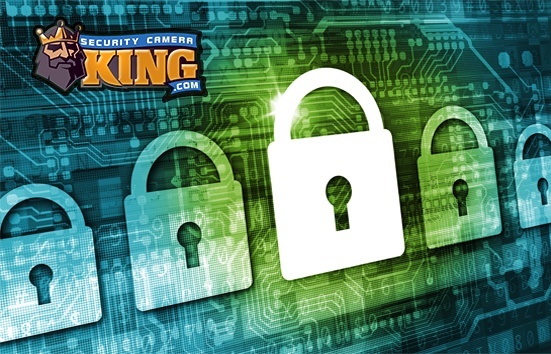 Security Camera King offers a wide variety of security guard pepper sprays and pepper spray accessories to accommodate a variety of needs. Many states regulate the use of pepper spray to the extent of how much can be possessed or carried on an individual. Generally speaking, of those states restricting the amount of pepper spray, the majority state that the user must carry less than 2.5 ounces (in New Jersey no more than .75 ounces). Security Camera King is aware of some of these state restrictions and that’s why we make available to you security guard pepper spray in .5 ounce canisters. These canisters come in a variety of types (such as visor clips, quick release key chains, and clips for example). In addition we also offer a variety of leatherette holsters in various configurations and colors designed specifically for use with the .5 ounce canisters. While the .5 ounce canisters are designed more for personal use, the true security guard pepper spray sizes are available too. We offer a variety of larger sizes ranging from 1.5 to 9 ounces with OC concentration beginning at 10 percent. If you are a security guard or own a security guard company, check out our line of security guard pepper sprays, triple action sprays, and Mace brand pepper security guard pepper sprays today.